Dublin: A. Millar, 1795. Later Edition. Hardcover (Full Leather). Very Good Condition. Full contemporary calf, neatly rebacked and with new endpapers. Modest foxing and staining internally, old signature to title page. Cagle 706 (1796 London ed. 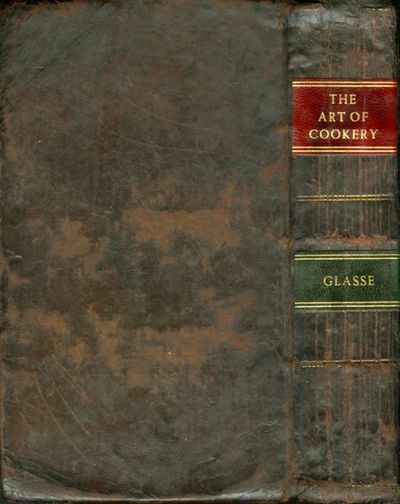 ), Interestingly, Glasse has changed her very early ice cream recipe from raspberry to apricot in response to Raffald's recipe (these are the the second and third recorded recipes for ice cream in English cookbooks). Size: 8vo (octavo). Quantity Available: 1. Shipped Weight: Under 1 kilo. Category: Cooking, Wine & Dining; Inventory No: CAT000161.